Summary: My initial impression was that it was not as moving as Crouching Tiger, though more aesthetically pleasing. ruthlessly amongst themselves for supremacy. The Kingdom of Qin is the most determined of all, its ambitious King (Chen Daoming) obsessed with conquering China and becoming her first emperor. As a result, he is the target of a number of assassins from the other kingdoms, including the legendary Broken Sword (Tony Leung Chiu Wai), Flying Snow (Maggie Cheung Man Yuk), and Sky (Donnie Yen). 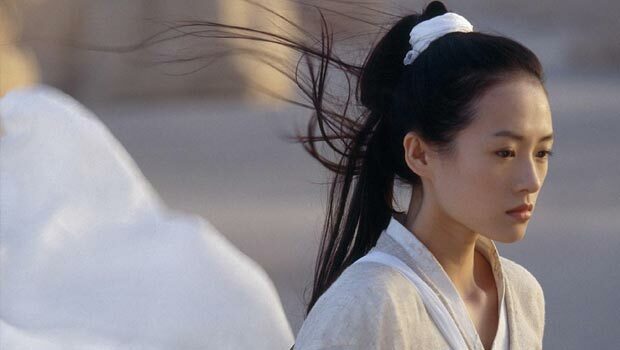 The King offers a huge reward to anyone who could defeat the three assassins, but for ten years no one comes close, until the enigmatic Nameless (Jet Li) arrives at the palace bearing the weapons of slain assassins. which contradicts Nameless’ story. Which version is the truth? and Christopher Doyle have succeeded in creating a visual masterpiece. attacking the King in his throne room hung with billowing green silk curtains. under a vast, beetroot coloured sheet. watching it a second time.